Where do most schools house YouthTouch ? How does a special class work ? How does YouthTouch work in individual classrooms ? What factors should I consider for a special class ? Is a traditional lab setting like a computer lab ? Does the special class last all year ? How does it work in a pull out program ? Are there any arrangements that don’t work ? What factors should I consider for classroom installation ? How long does it take to get YouthTouch fully implemented in a school ? What factors should I consider for a traditional lab type installation ? What comes in the YouthTouch Technology Integration package ? Where do most schools house YouthTouch ? There are two main ways: in individual self contained classrooms, or in a centralized location. The centralized locations work as traditional labs, pullout programs, or special classes. How does YouthTouch work in individual classrooms ? Many schools distribute the equipment among classrooms in a grade appropriate manner with a classroom designated the “homebase” for each piece. 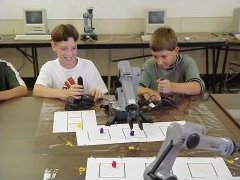 For example, if there were two sections of 5th grade, two RoboArms might be based in each 5th grade room, where they would remain for most day-to-day usage. However, when one 5th grade teacher plans to teach a week’s unit involving whole class activities with RoboArm, he/she would borrow the other two RoboArms for a few days. Is a traditional lab setting like a computer lab ? Pretty much. Some schools install YouthTouch in a central location, using a lab model. Classes visit the lab with their own teacher to do YouthTouch activities, on a regular schedule or on an irregular basis. How does it work in a pull out program ? A few schools have successfully incorporated YouthTouch in a pullout science program. The “pulled out” students leave their regular classes when called and visit the science lab where YouthTouch is also located. They receive their instruction from the science teacher whose homeroom is the science lab. What factors should I consider for classroom installation ? This approach works best with self contained classrooms, and it works where the ratio of YouthTouch equipment in the building/ to the number of students participating in the program is adequate. Lack of space and electrical outlets is often an issue, and there must be a sufficient number of computers. If resources are not stretched too thin, this plan allows the most natural daily integration across subject boundaries. What factors should I consider for a traditional lab type installation ? Is the lab accessible without wasting too much class time in transit ? It will be necessary to reserve lab time in advance, and a schedule must be maintained and monitored. The integration is harder to effect seamlessly than were the equipment in the classroom, but space and computer availability often make this choice practical. How does a special class work? Several schools which are departmentalized at the upper elementary level have developed a a special class around YouthTouch. It is the primary learning tool used by the teacher in the “Robotics”, or “Technology” class. This approach also works well when done right. What factors should I consider for a special class? The special class requires good planning and extra resources—a teacher and a room with computers. The scheduling logistics must be managed to minimize the downtime of the equipment. It is most important to ensure that the special class supports the core curriculum content. Does the special class last all year? It could. We know of one school that uses YouthTouch as an enrichment class. Students there choose one enrichment class which meets one period per week all year. Another rotates 25% of the students through each 9 weeks. Are there any arrangements that don’t work? We do not recommend a lending library model. This is where the equipment is kept on a shelf, but is not hooked up and operational. Pieces of equipment are checked out by teachers as though they were books in a library. This is awkward and too much time is wasted in set-up. How long does it take to get YouthTouch fully implemented in a school? Usually 2-3 years. It is tempting to be very ambitious from the start, but a phased approach seems to work better. It does not take long at all to get started in a limited way. The most successful implementations have started in a limited way and then grown by plan over time. Schools have started using YouthTouch in only one grade or in one subject area. They have even restricted the first year further to include only a certain piece of equipment. They build on this sound base as they expand the scope of YouthTouch involvement. Some of our oldest and best performing sites have expanded from modest beginnings to district-wide implementation. What comes in the YouthTouch Technology Integration package ? One Full day of on-site teacher training. Extremely remote/limited access communities may receive training via distance learning modalities. One Full year of upgrades to software and CIM.